These drivers were being tested on their ability to see a motorcycle in a picture when they weren’t necessarily expecting it. If this were a test in school, they would have failed. In one experiment, 65% of participants missed a motorcycle on the road, while only 31% missed a taxi in the same position. Furthermore, when asked to predict their future driving behavior, drivers predicted that they would be more likely to not notice a motorcycle on the road than to not notice a taxi. 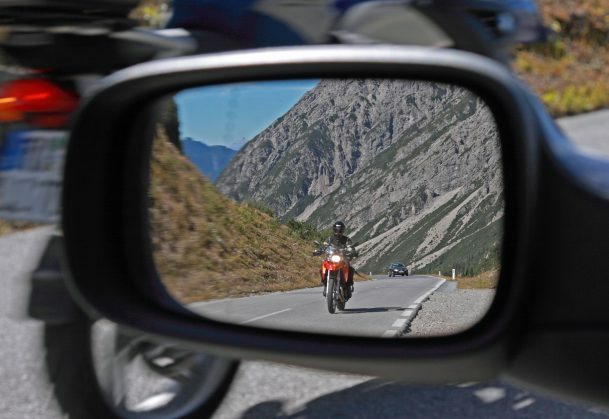 These results suggest that drivers on the road may not notice motorcycles because they aren’t looking for them, and may increase their chances of a crash with a motorcycle because their attention is much more focused on what cars around them are doing. This research was spurred by the fact that motorcycle crashes are frequent and frequently fatal. The most concerning aspect of these crashes is the number of “Looked but Failed to See” (LBFTS) crashes — those accidents where a driver checked for oncoming traffic or looked before changing lanes, but then reported not seeing the motorcycle they crashed into. Motorcycle size and visibility have both been offered as explanations for this phenomenon, but psychological science researchers, including Kristen Pammer, Stephanie Sabadas, and Stephanie Lentern of the Australian National University in Canberra, believe that a recognized psychological concept called ‘inattentional blindness’ may play a large role in these accidents. Inattentional blindness is a failure to see an object in real life or on a display, not because of visual disability or too-brief exposure to the image, but because the person in question simply doesn’t devote attention to that object. Pammer and colleagues set up a driving simulation where participants simply looked at an image taken from a driver’s perspective, then answered questions about the picture they had seen. The second-to-last image they saw had a car turning out of their lane, and either a motorcycle or a taxi in the opposite-facing lane and separated by a median. When asked if they noticed anything besides the turning car, 61% of participants missed the motorcycle, as compared to 31% who missed the taxi. Follow-up experiments found similar results, with slightly more people noticing the taxi and the motorcycle if the turning car was farther out of their lane and more people noticing the motorcycle if it appeared to be moving into the driver’s lane. A September 2011 article by Harvard psychological scientists Michael Cohen, George Alvarez, and Ken Nakayama demonstrated that demanding tasks increase attentional blindness. They found that viewers do not automatically perceive elements of their environment without paying them attention, as was suggested in previous research. Driving a car is a very demanding task, and it is safe to assume that drivers do miss certain aspects of their surroundings when paying attention to the most salient cues on the road. Yale psychological scientist Steven Most and colleagues suggested in a 2005 paper that people construct an ‘attentional set,’ a range of cues that they primarily focus on and that is relevant to a task. Motorcycles, it seems, aren’t included in this set for many drivers. Backing up this theory is the fact that drivers rated themselves more likely to miss a motorcycle in real-world driving scenarios as compared to taxis, even though people rated the likelihood that motorcycles would be on the road the same as taxis. Pammer and her collaborators suggest that this set could be expanded, however. Just because people don’t look for motorcycles doesn’t mean they couldn’t look for them if they made motorcycles a part of their attentional set. They say more research is needed to find if intentionally training drivers to look out for motorcycles would lead to few LBFTS crashes or fewer instances of inattentional blindness for motorcycles. Pammer, K., Sabadas, S., & Lentern, S., 2017. Allocating attention to detect motorcycles: The role of inattentional blindness. Human Factors. DOI:10.1177/0018720817733901. Most, S.B., Scholl, B.J., Clifford, E.R., & Simons, D. J. (2005). What you see is what you set: Sustained inattentional blindness and the capture of awareness. Psychological Review, 112(1), 217-242. DOI:10.1037/0033-295X.112.1.217. The idea that many behaviours are “automatic” is one of the most pernicious ideas in cognitive psychology and held by many people outside academia. First, it is typically not defined. What does that term mean? Second, there are well designed experiments showing that various behaviours are not “automatic” in various senses. We have reified this term; its not useful. I applaud the authors of this article. Changing behaviour requires us to give up ideas that get in the way of trying to understand mental processes, and are a necessary preliminary to effecting change.